You know those days when you walk in the door much later than intended, you don’t have much in the house, and you don’t have much energy? We had one of those last week. Enter… the Mexican Mushroom Stack. A primal and grain-free dinner that is ready in less than 15 minutes, and is actually so yummy that you’ll make it even if you have the time to make something far more complicated. Yes, you can spend just 15 minutes on a meal and everyone will be just as appreciative as if you cooked for hours. Try it, I dare you. I know, I know, that doesn’t look like a meal. But two just looked weird on the plate. That being said, these mushies were smaller than the palm of my hand and three of these stacks each was enough to fill up both T and me. I’m calling three a good serving size. …And then frying them up in a mixture of butter & macadamia oil (I add macadamia oil to give the butter a bit of stability and help prevent the milk solids from burning too early). A couple of minutes each side will do – you don’t want them to go soggy. Just until they start to brown nicely while still being firm in the centre. And then all you need to do is top each one with a dollop of homemade guacamole, a dollop of sour cream, and a sprinkle of finely chopped chives! Done like a dinner. gently! - then get these stems back in the fridge to repurpose in another meal. Heat up your frying pan (cast iron - heat on low; anything else - heat on medium-high), then add your butter & macadamia oil. 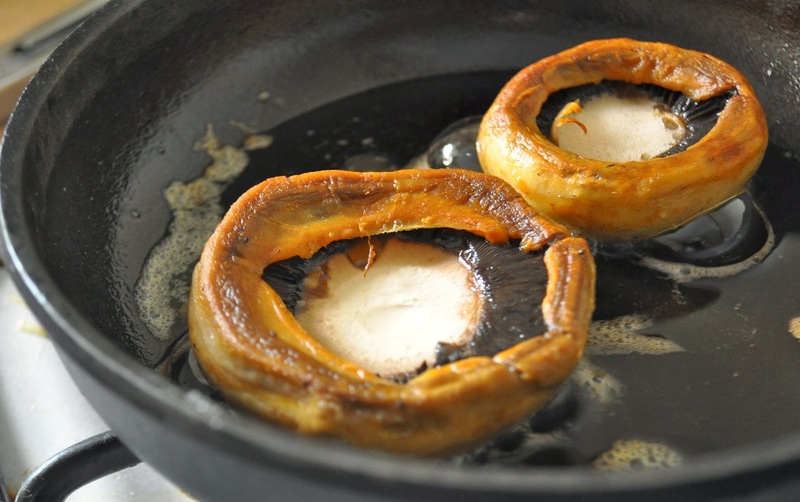 Add your mushrooms, stem-less side down, into the pan (don't overcrowd). Fry on one side for 2 minutes, then turn & fry on the other side for a further two minutes. 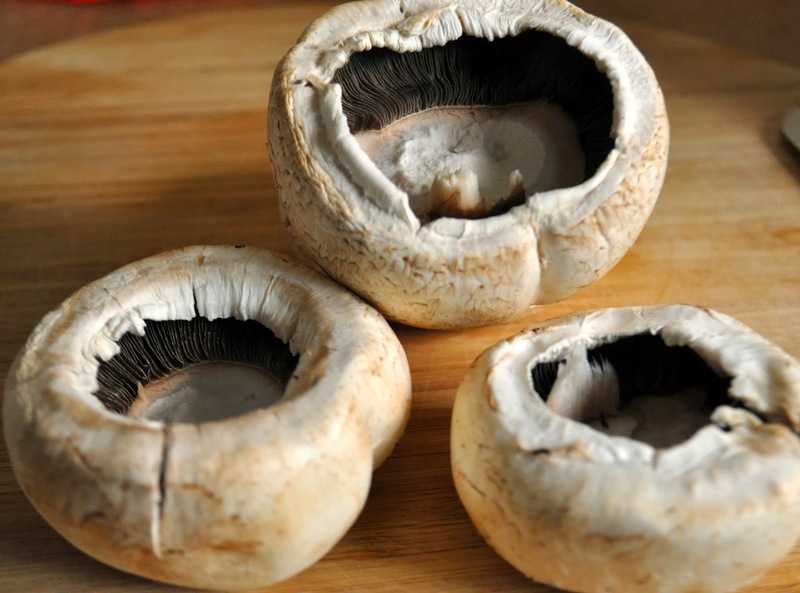 Remove to a paper towel and repeat until all mushrooms are cooked. Meanwhile, scoop the flesh of your avocados into the Thermomix bowl. Add paprika, cumin, coriander, garlic powder, and salt to taste - three or four twists of the salt shaker is where it's at, in my opinion. Squeeze all the juice in your lemon into the bowl. For a chunky guacamole, mix on reverse and speed 5 for just 2-4 seconds (stop at 2 seconds and check consistency; proceed with caution). For a smooth guacamole, mix on speed 5 for 5 seconds. If you don't have a Thermomix, a food processor or a bowl and a fork will do. When all the mushies are cooked, stick 'em on plates, dollop on some guacamole, and add a dollop of sour cream on top of that. Sprinkle with chives, and away you go! 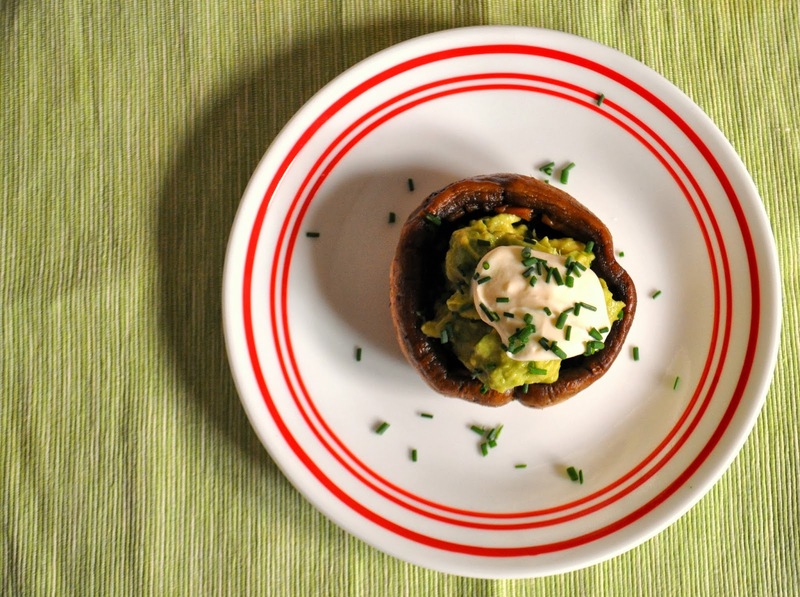 Easy as pie Mexican Mushroom Stacks!